'What do you want to be when you grow up?' We probably all remember being asked this when we were children. It's a reasonable question but it implies two things. It suggests that we reach a point when we have 'grown up' and that once we get there our careers are suddenly secure, stable and fulfilling. However Now Teach is based on the idea that this is an outdated view of the way our lives pan out. We are all living longer. We all know the problems of an ageing population, but we forget to tell ourselves the good news: we are astonishingly lucky in that we can expect so many more years of life than our ancestors. A whole new generation has silently appeared. They are not young or even middle-aged, but they are most certainly not old. We want these people to embrace the idea that after decades in one line of work, it is desirable to retrain. We want to bring their skills and experience to those who could most benefit from them. We help them become teachers. Learning meaningful new skills keeps us healthy and happy, so if you've been feeling dissatisfied with your job for some time, career-change could bring back that sense that your job is worthwhile. Recent research has shown a link between feeling what you do is valuable and remaining healthy as you age. Data from the Mental Health Foundation show that retirees' risk of depression is reduced by meaningful activity, such as volunteering or part-time work. This 'meaningful dividend' is not just about retirement – it applies to all of us. Bearing this mind, if you're 45 and not sure your job is helping in a way that really matters, please don’t keep going for another twenty years! At last year's Longevity Forum I was particularly struck by the advice from a pension expert. I’d expected him to talk about I should be putting more into shares and ISAs than I am. Instead he talked entirely about how we should be investing as much in our own development and education throughout our career. He advised that we should always be prepared to re-educate ourselves in order to live the fullest life possible. The point was that instead of seeing our career as a steady rise up a ladder with an abrupt stop at 65, we should embrace change. That could include re-evaluating your current job and considering a multi-phase career. Lucy Kellaway and I co-founded Now Teach after Lucy realised she needed a new direction. She'd had a long and successful career as a journalist at the Financial Times but realised that she was no longer learning anything new. This experience is common to many of the people joining Now Teach. Over the past two years we have empowered over 120 lawyers, doctors, bankers, civil servants and senior managers to re-engage with the pleasure and struggle of learning. They weren't unhappy in their careers but they had stopped feeling challenged. That's not to say that starting again is easy. Changing career at all is difficult and training to teach particularly so; we are here to help our trainees face these challenges and succeed in their new roles. Our staff make sure participants understand what they are signing up for and are there throughout the training and into the early years of teaching. However, the key ingredient of Now Teach is what our participants do for each other; it is in becoming a true movement. We give our trainees plenty of opportunities to meet, discuss their training and form relationships – and then the real magic happens. This peer network is what truly helps them through the hard times and it is what will mean they will go on to become inspiring and effective teachers. The flipside of this debate around the positive power of learning is that many people are excluded from its benefits. 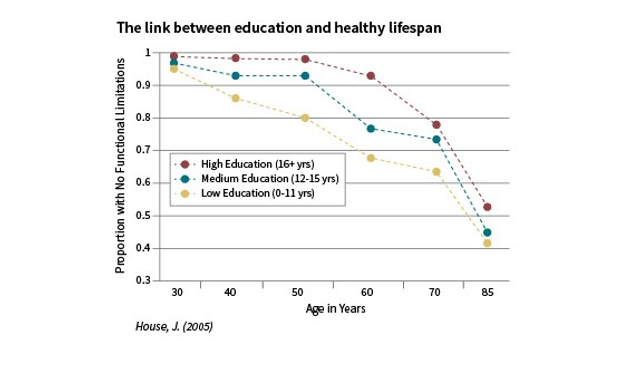 Children from poorer backgrounds are more likely to underachieve at school than their wealthier peers and more likely to encounter ill-health sooner as they get older. Great schools are engines of equality, so giving more children access to opportunities through great teaching is central to our mission. Now Teach believes that bringing experienced teachers into the classrooms of children from poorer backgrounds will mean the two ends of the age spectrum can serve one another to their mutual benefit. We also want to be part of a wider movement that re-examines our assumptions about careers and retirement. Now Teach is partnering with the UK Encore Fellows programme to provide ways for those approaching retirement to explore working in different sectors and there are more plans in the pipeline. If someone asked me what I wanted to be when I grew up, I certainly didn’t say I wanted to run an education charity. And it might be that I don't do it my whole career. But if I do, it will be because I am still learning and challenged. If you are not sure you are still learning, or as excited as you once were, I hope you might be thinking about restarting as something new. And if you are thinking that teaching might be your next career move, please email us! "we should always be prepared to re-educate ourselves in order to live the fullest life possible."